How Many Calories Are in a Snickers Bar? Sabrina Stapleton has been writing since 2001 with her work focusing on academic writing in the field of health and fitness. Stapleton holds a Master of Arts in physiotherapy as well as a Bachelor of Science degree in sports rehabilitation and physiotherapy from Kings College University. A Snickers bar is a delicious chocolate composed of caramel, roasted peanuts, nougat and milk chocolate. A Snickers bar is available in a miniature, king-size and fun size bar. There are 266 calories present in 1 Snickers bar that is 2 oz. Thirty-seven percent of those calories are from fat, 55 percent from carbohydrates and 8 percent from protein. 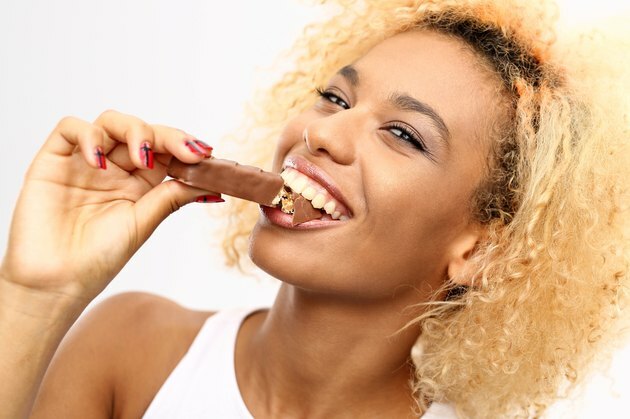 According to the website Fatsecret.com based on 2,000 calories per day a Snickers bar contains 13 percent of our daily recommended amount. The Food and Drug Administration suggests adults consume between 2,000 and 2,500 calories per day. Calories are an important part of our daily diet; calories are the energy found in different foods. People's bodies need energy for normal everyday functioning. A Snickers bar does not contain any vitamins. According to the MedlinePlus website, vitamins are required for the bodies’ normal growth and development. A vitamin deficiency can cause a number of different illnesses. Therefore it is important to consume vitamins on a daily basis. How Many Calories Are in a Cup of Apple Juice? What Types of Foods Supply Carbohydrates, Proteins & Lipids?